About a week ago, we discovered a new addition to the Innovative Marine lineup in the form of a new needlwheel foam fractionator. Called the SkimMate protein skimmer, this new piece of hardware is IM’s first step to creating their new Auqa Gadget series, which should have several more additions in the coming months, and it’s the perfect complement to their line of stylish LED powered Nuvo aquariums. When we first found the SkimMate protein skimmer, all we had to go on was a brief video. Fortunately, we got to chat with the gang at IM at length, and they spilled the beans on their new skimmer and even sent us a couple of photos. As we assumed in our original coverage of the protein skimmer, the IM SkimMate will be offered in a couple of models that can be utilized in three different sized aquariums. The smallest of the two, called the Desktop skimmer, is rated for tanks up to 25 gallons and will fit nicely into the rear chamber of the Nuvo Nano 16 aquarium. We’re told that it will also fit into the Nano 8 aquarium, but IM won’t officially market it for that tank simply because the water level in the chamber where the protein skimmer would sit fluctuates and would require constant monitoring in order to be effective. Still, we’re told it works beautifully on either setup. The retail price for the Desktop SkimMate is set at $100, which is quite an attractive price point and comparable to other products on the market. 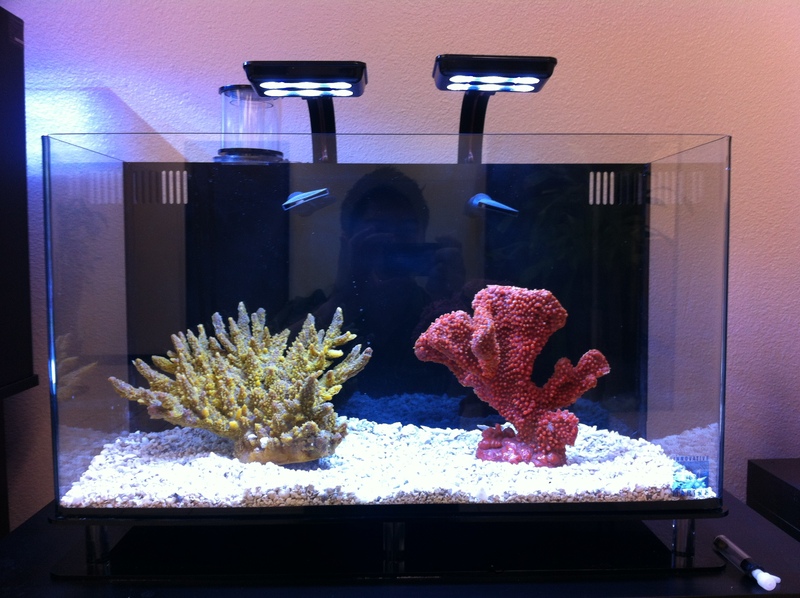 The second model on the list, called the Midsize skimmer, was designed to work with the IM Nuvo Micro 30 and Mini 38 aquariums. It is rated for 65 gallons of water volume, and as with the Desktop model, this larger skimmer fits discreetly into the rear chamber of the two Nuvo models. The Midsize SkimMate will retail for $130. Differing only in dimensions, both protein skimmers will come with a needlewheel pump that chops up the bubbles in order to create a nice frothy collection of dissolved organics that’s dumped into the collection cup. 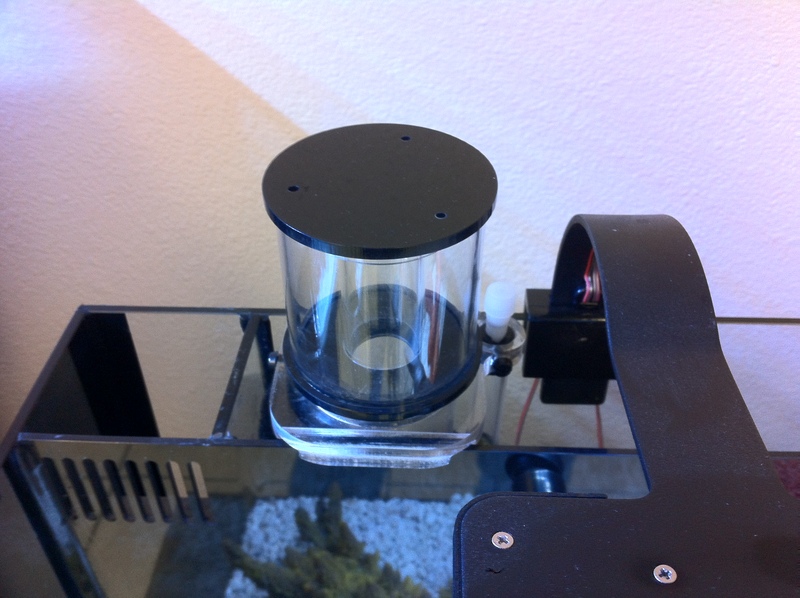 The body of the skimmer is made of cell-cast acrylic and mounts to the aquarium with the help of a clam mount skimmer bracket which also houses an integrated air silencer that can be easily adjusted with a single finger. In terms of a release date, Innovative Marine told us that the SkimMate protein skimmers, which have been in development almost since the Nuvo aquariums hit the market, would be late August. By then, the shelves of both the local fish stores and online vendors who carry IM products should also be loaded up with the new protein skimmers. We’re also told that these skimmers will not fit into the rear chambers of other nano aquariums like the Oceanic Biocube or JBJ USA Nano Cube. Continue below for a list of all the skimmer’s features.